Keizer police arrested three individuals on drug-related charges after pulling over a driver spotted using his mobile phone Monday, Feb. 20. About 11:45 p.m., a Keizer officer pulled over a 1998 Buick Century with five occupants on Chemawa Road Northeast south of McLeod Lane Northeast. After speaking with the occupants, three arrests were made. 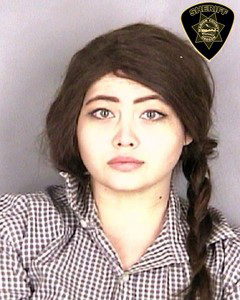 Aubrey Jade Rose Crook-McCoy, 24, of Jefferson, Ore., was charged with unlawful possession of methamphetamine. Thomas Joseph Mendoza, 33, of Keizer, was charged with unlawful possession of methamphetamine, driving while suspended, driving uninsured and unlawful use of a telecommunications device. Brandon Scott Wilhite, 24, of Salem, was charged with interfering with a police officer, unlawful possession of methamphetamine and resisting arrest. Three vehicles were stolen within two hours from locations along the north end of River Road North in Keizer on Saturday, Feb. 19. The rash of thefts began with the report of a vehicle stolen from 5014 River Road North, near Dollar Tree, about 6:15 p.m. A 1993 Honda Accord was taken while the driver was inside shopping. After checking the area, the vehicle was found abandoned in the parking lot of Quality Suites on Wittenberg Lane Northeast. At 7:14 p.m., a 1994 Honda Civic was reported stolen from the Safeway parking lot at 4990 River Road N.
While an officer was en route, she called to report she found the vehicle across the street in the parking lot of Willamette Animal Hospital, 4975 River Road N.
The driver’s side window had been broken out and the car was disabled because the ignition had been damaged. At 7:35 p.m., police received a report of a stolen 1992 Honda Accord at Quality Suites, 5188 Wittenberg Lane N.E. The owner told police she had parked the in the middle of the parking lot and the car was not there when she returned. The car was located the following day parked behind Classic Dance Studio, 392 Chemawa Road N. Subwoofers valued at $1,000 were reported stolen from the vehicle. While there are no suspects in the three thefts along River Road, Keizer police Sgt. Dan Kelley made a stolen vehicle arrest later that same evening about 10 p.m.
Kelley spotted a dark-colored 1996 Honda Accord in the curb lane near Chemawa Road Northeast and McLeod Lane Northeast. He began trailing the vehicle and ran the plates. The car had been reported stolen to the Salem Police Department. After initiating a traffic stop on Springtime Court Northeast, additional officers joined Kelley and Alexander James Mendez, 19, was taken into custody. Mendez was taken to Marion County Correctional Facility and charged with unlawful use of a motor vehicle. • 12 p.m. – Theft from vehicle on 1300 block McGee Court NE. • 5 p.m. – Theft from vehicle on 1200 block McGee Court NE. • 8:30 p.m. – Theft from vehicle on 1200 block McGee Court NE. • 9:30 p.m. – Theft from vehicle on 1200 block McGee Court NE. • 11 p.m. – Stolen vehicle on 5100 block Wittenberg Lane NE. • 7:06 a.m. – Accident on 1500 block Lockhaven Drive NE. • 8:30 p.m. – Sudden death on 2400 block Tynel Court NE. • 9:03 p.m. – Stolen vehicle on Tryon Ave NE and Broadway Street NE. • 12:40 a.m. – Arrest for warrant on McLeod Lane NE and Chemawa Road NE. • 3 a.m. – Theft on 15th Ave N and Chemawa Road N.
• 1:15 p.m. – Physical harassment, disorderly conduct, assault and reckless endangering on 4800 block River Road N.
• 2:12 p.m. – Theft on 7400 block Parkplace Drive NE. • 4:21 p.m. – Arrest for restraining order violation on 4800 block River Road N.
• 10:09 p.m. – Arrest for bench warrant on 1000 block Candlewood Drive NE. • 12:31 p.m. – Theft on 3800 block River Road N.
• 1:39 p.m. – Theft on 6000 block Ulali Drive NE. • 5:20 p.m. – Theft on 4000 block River Road N.
• 11 p.m. – Arrest for false information to police officer on Cherry Ave NE and Salem Industrial Drive NE. • 11:11 p.m. – Arrest for bench warrant on Cherry Ave NE and Salem Industrial Drive NE. • 10:52 a.m. – Theft on 5200 block Winter Leaf Court N.
• 5 p.m. – Disorderly conduct on 4200 block Arnold Street NE. • 5:15 p.m. – Theft on 3300 block River Road N.
• 8:01 p.m. – Stolen vehicle on 500 block Chemawa Road N.
• 10:31 p.m. – Minor in possession alcoholic liquor on 400 block Churchdale Ave N.
• 1:10 a.m. – DUII on 5000 block River Road N.
• 2:49 a.m. – DUII on Cherry Ave NE and Clearview Ave NE. • 6:58 p.m. – Theft, fraud use of credit card on 5100 block River Road N.
• 8 p.m. – Theft from vehicle on 500 block Juedes Ave N.
• 9:30 p.m. – Stolen vehicle on 100 block Homewood Court N.
• 12:14 a.m. – Arrest for warrant on 2800 block Broadway Street NE. • 11:12 a.m. – Traffic accident on 1600 block Lockhaven Drive NE. • 2:49 p.m. – Carry concealed weapon on 5200 block Hazelgreen Road NE. • 7:48 p.m. – Arrest for warrant on 600 block Lockhaven Drive Road N.
• 9:26 p.m. – Arrest for bench warrant on 300 block Snead Drive N.
• 10:21 p.m. – Criminal mischief and vandalism on 4700 block Harcourt Ave NE. • 11 p.m. – Criminal mischief and vandalism on 1400 block Alder Drive NE. • 4:45 a.m. – Theft from vehicle, unlawful entry vehicle with intent to commit theft on 3900 block Pleasant View Drive NE. • 7:36 a.m. – Traffic accident on 600 block Chemawa Road N.
• 10:15 Hit and run traffic accident 3800 block River Road N.
• 12:45 p.m. – Traffic accident on 6500 block Wheatland Road N.
• 8:54 p.m. – Theft on 6400 block Keizer Station Blvd NE.